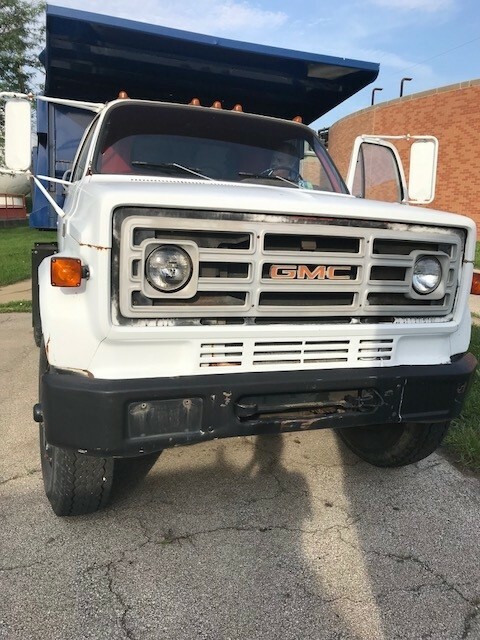 One (1) USED 1980 GMC 7000 Dump Truck with approximately 21,720 miles . This mileage may not be the actual miles on this vehicle, but the speedometer/odometer work correctly and BNWRD is the original owner of this vehicle. This is a single axle GAS dump truck. 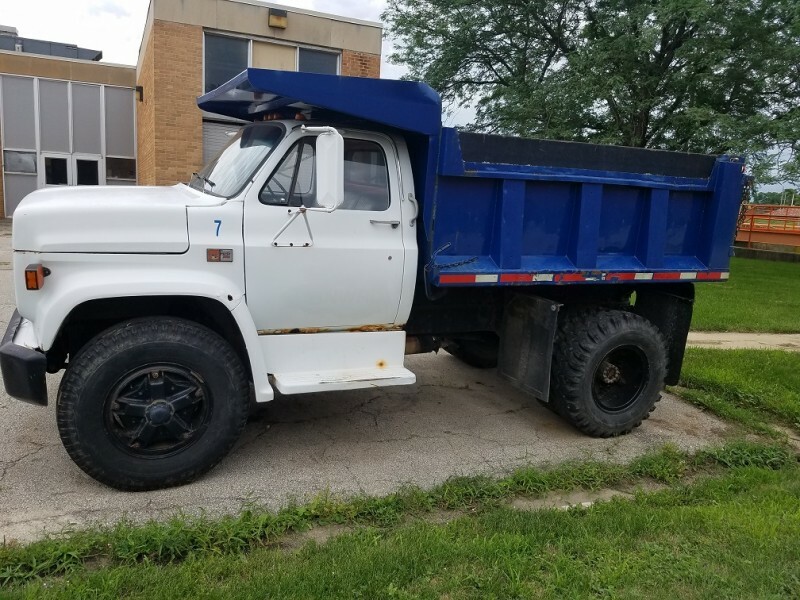 This truck is equipped with a 5 speed MANUAL transmission with a two speed rear axle, a fully functioning 9 foot hydraulic dump bed and a GMC V-8 366 Cubic Inch, 4 barrel GAS engine. 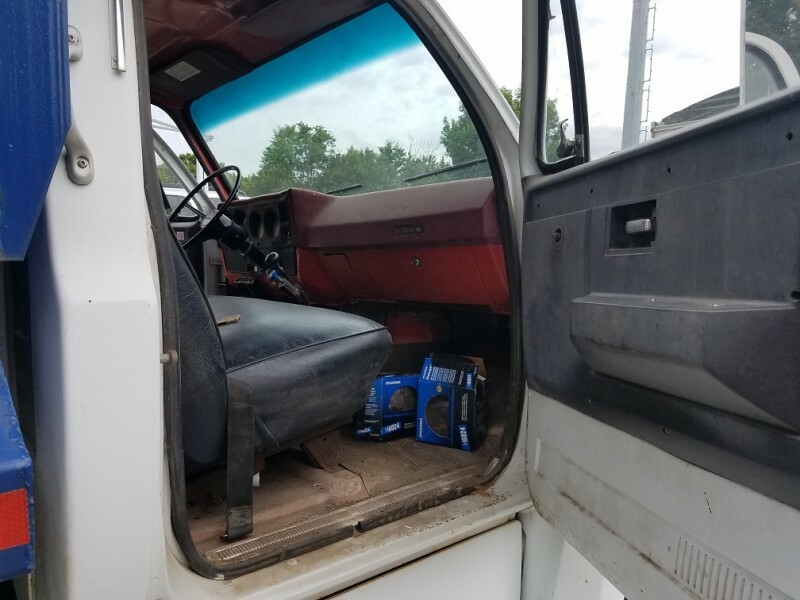 This truck IS NOT equipped with Air Conditioning or cruise control. 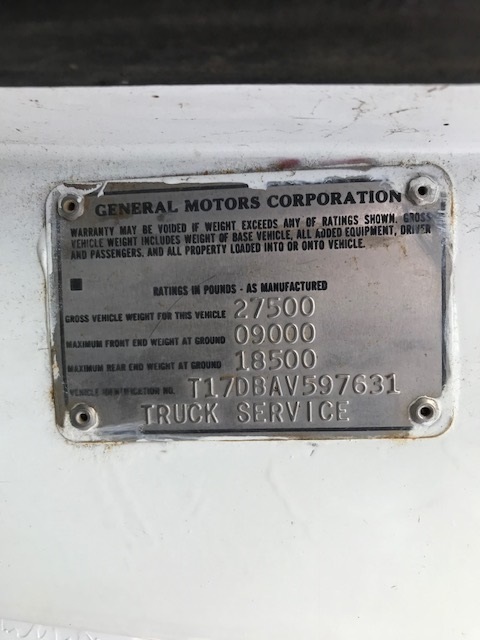 This truck has a GVWR of 27,500 lbs. with the maximum front end weight at ground being 9,000 lbs and the maximum rear end weight at ground of 18,500 lbs. 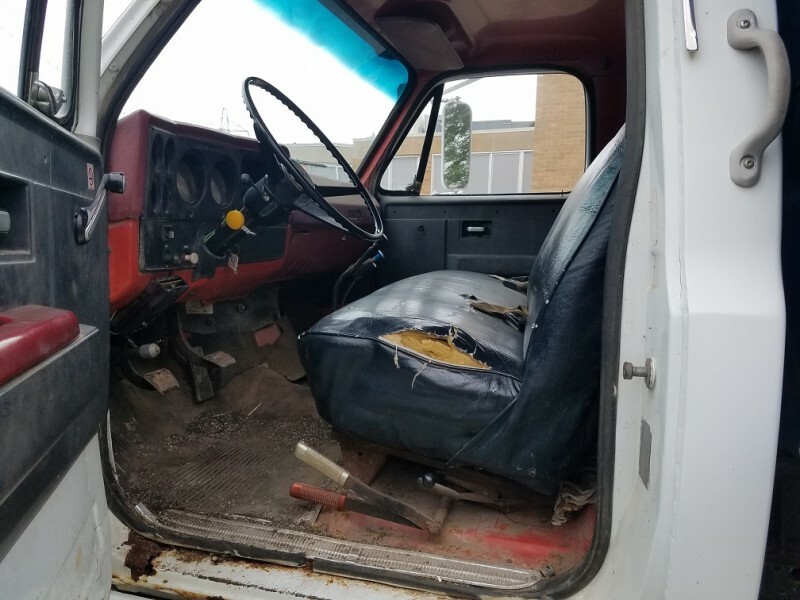 This vehicle is being sold and is being sold AS IS WHERE IS. This unit starts, will propel itself forward and reverse under its own power and has been driven on the road within the past 30 days. 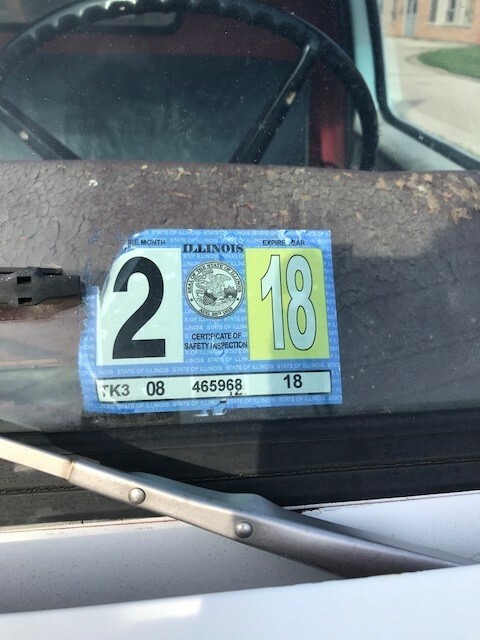 This unit has a expired State of Illinois Inspection Sticker (February, 2018). 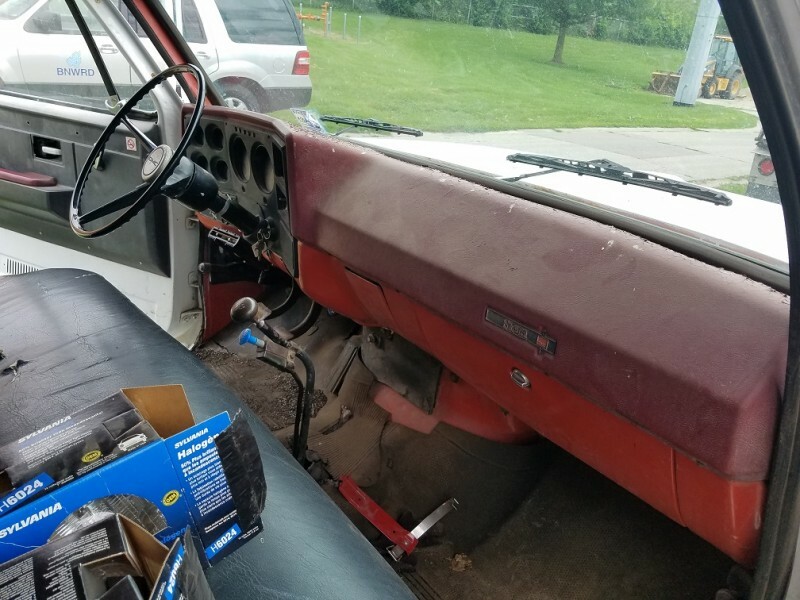 This unit may need additional work to upgrade its condition, including, but not limited to, miscellaneous body work to repair dents and rust damage which includes, potential repairs to the dash and a rip/tear in the driver's side of the bench seat. This vehicle may need new belts and possible mechanical work. 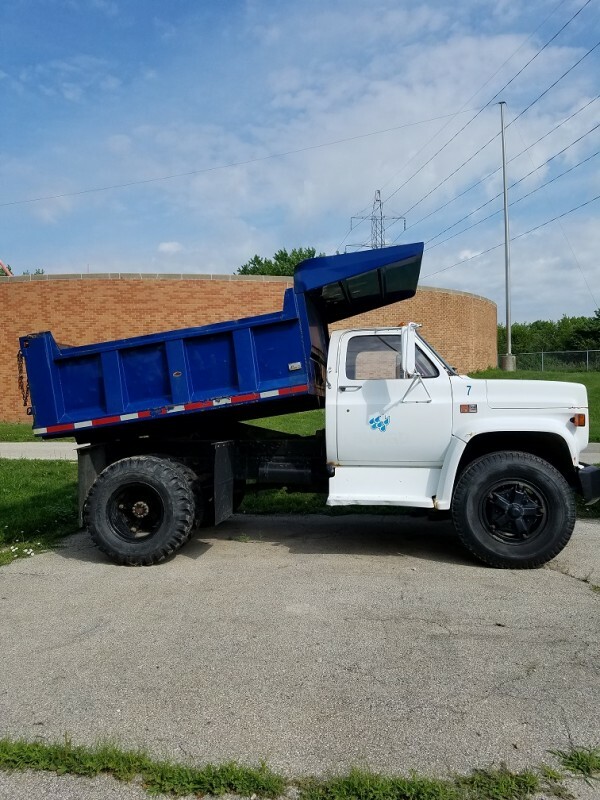 This truck has mainly been stored outside and was used to haul miscellaneous material at our facility. 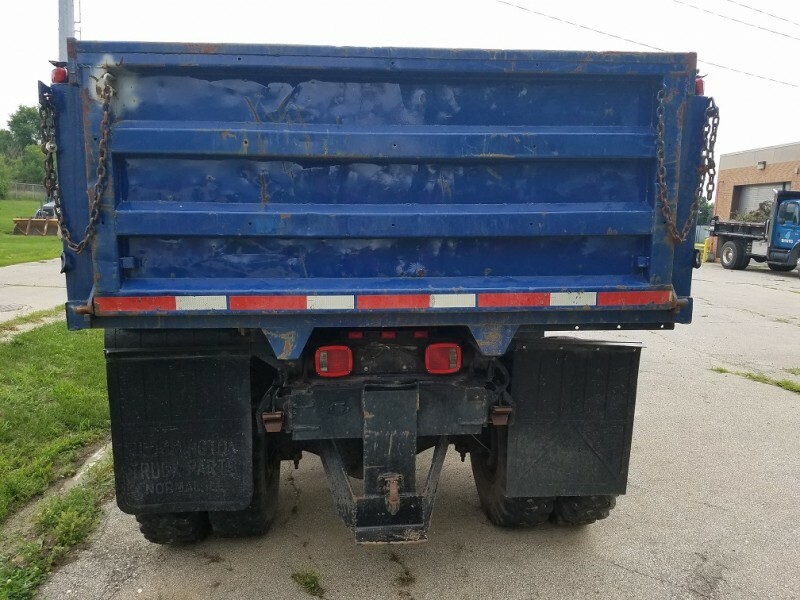 We strongly encourage you to review the pictures we have posted and schedule an appointment to inspect and drive this truck prior to bidding. THIS IS A GAS TRUCK. Item is being sold AS IS – WHERE IT IS. Successful winning bidder will need to make payment via CASHIERS CHECK within 5 days of the close of this auction. Item must be removed from current location within 10 days of the close of this auction AFTER PAYMENT IN FULL HAS BEEN RECEIVED BY BNWRD. Failure to make payment within 5 days of the close of the auction or to remove this item within 10 days of the close of the auction from its current location will result in forfeiture of all funds paid and the item will be relisted in another auction. You may make arrangements to view this item by contacting Randy Stein via email: rstein@bnwrd.org or by calling 1-309-827-4396. PAYMENT MUST BE IN THE FORM OF A CASHIER’S CHECK MADE PAYABLE TO "BNWRD". PAYMENT MUST BE MADE WITHIN 5 DAYS OF CLOSE OF AUCTION. ITEM MUST BE REMOVED FROM CURRENT LOCATION WITHIN 10 DAYS OF CLOSE OF AUCTION AFTER PAYMENT IN FULL IS RECEIVED BY BNWRD. You may make arrangements to view this item by contacting Randy Stein via email: rstein@bnwrd.org or by calling 1-309-827-4396. 1. All property is offered for sale "AS-IS, WHERE-IS" with no warranty or guarantee as to its fitness for any use or purpose offered or implied. Please note that ALL SALES ARE FINAL. There are no refunds or exchanges. 2. Every effort will be made to accurately describe the items offered for sale. However, the bidder is cautioned that the items presented are used and may contain defects not immediately detectable. Items are available for public inspection prior to your bidding. Please use your best judgment when bidding. 1. The Bloomington – Normal Water Reclamation District will not provide security for your purchases. Therefore you should remove your equipment immediately. 2. Once you buy it is your responsibility to secure the property. 1. Absolutely “NO” Crushing, cutting up or dismantling of any equipment will be allowed. Any and all removal needs will be the buyers responsibility. 4. Loading and removal of equipment from any location. 1. 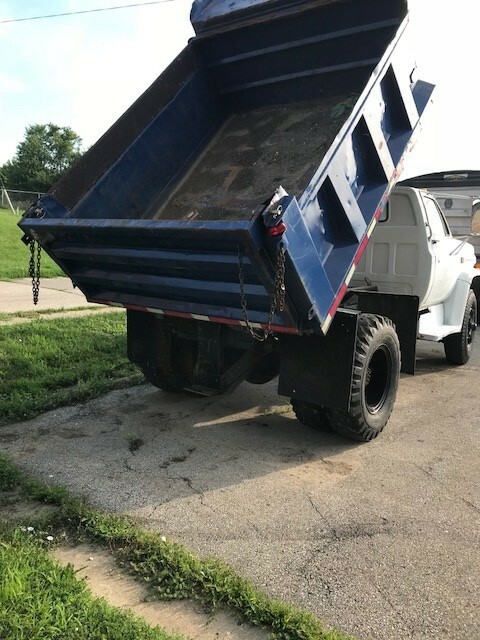 The Bloomington – Normal Water Reclamation District will not load any equipment on private trucks or trailers due to liability issues surrounding safety and the condition of private trucks/trailers and load capacities. The Bloomington – Normal Water Reclamation District will not allow purchasers to work on vehicles on Bloomington – Normal Water Reclamation District property, with the exception of minor repairs needed to make the vehicle road worthy to remove it from the Bloomington – Normal Water Reclamation District premises. 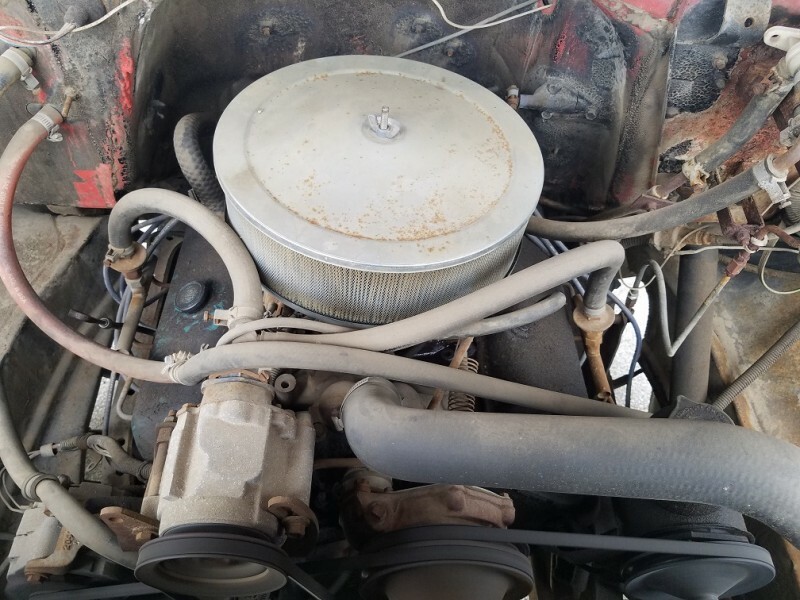 Minor repairs include checking fluid levels, jumping or replacing batteries, belts/hoses replacement, tire repair/replacement, replacing wiper blades, light bulbs and headlights. The Bloomington – Normal Water Reclamation District will not provide the buyer any tools needed to make these repairs. VEHICLES/EQUIPMENT SOLD BY THE BLOOMINGTON – NORMAL WATER RECLAMATION DISTRICT ARE SOLD “AS IS,” “WHERE IS” AND NO WARRANTIES, WHETHER EXPRESS, STATUTORY OR IMPLIED INCLUDING, BUT NOT LIMITED TO ANY IMPLIED WARRANTY OF MECHANTABILITY AND THE IMPLIED WARRANTY OF FITNESS FOR A PARTICULAR PURPOSE, BOTH OF WHICH ARE HEREBY EXPRESSLY DISCLAIMED BY BUYER. NO EMPLOYEE, AGENT OR REPRESENTATIVE OF THE BLOOMINGTON – NORMAL WATER RECLAMATION DISTRICT IS AUTHORIZED TO GRANT ANY WARRANTY OF ANY TYPE WHATSOEVER OR TO MODIFY THE TERMS OF THIS DISCLAIMER IN ANY MANNER. Purchasers of used vehicles sold by the Bloomington – Normal Water Reclamation District are cautioned, strongly encouraged and advised to have the unit inspected prior to bidding on said item and/or operation of said item. All Purchasers are further cautioned that they are solely responsible for conforming to the requirements of any applicable and lawful ordinance, rule or statute governing the resale of vehicles purchased from the Bloomington – Normal Water Reclamation District. PAY VIA CASHIER’S CHECK ONLY, WITHIN 5 BUSINESS DAYS OF THE SALE- OR THE SALE WILL BE CANCELLED.